Every team has its own unique qualities that make it work and not all of them operate the same way. While we sit cozily together in our San Francisco office and can see who's in, that's not the case for everyone. 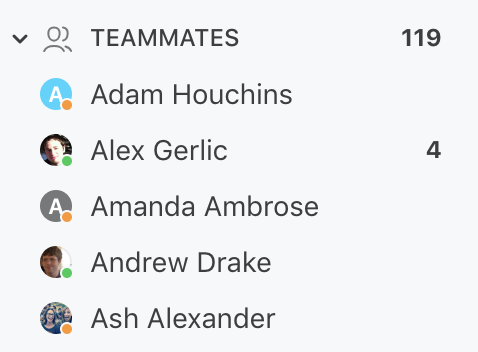 Front's teammat status can, at a quick glance, let you see who's online, who's away, and who's unavailable. Note: Offline is determined when Front can no longer send events to a Front desktop or web client for that respective teammate. It takes a little time for that event connection to break, and a little more time for that update to get sent to all other teammates. You should expect to see accurate availability within a few minutes of a teammate closing the Front client.